Translated for the LEC/Heritage Press by Gilbert Seldes, who also introduces the book. 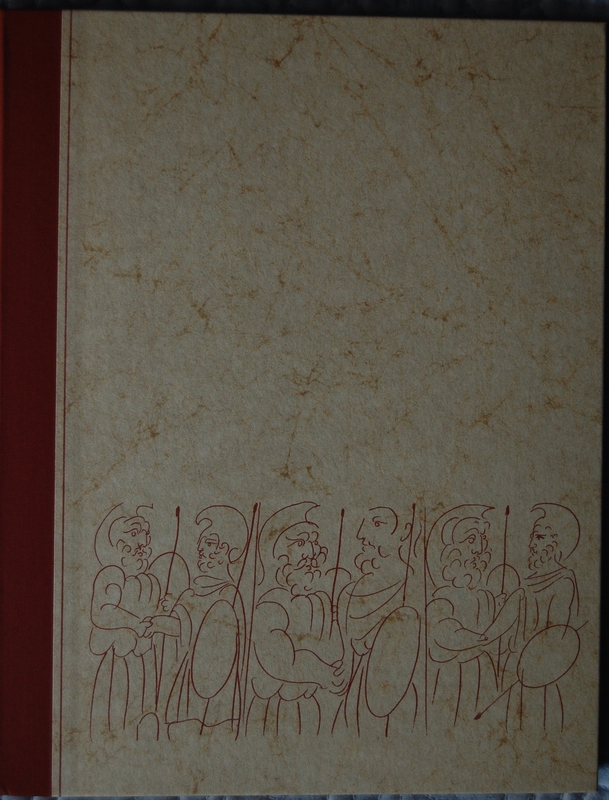 Front Binding – Aristophanes is one of the few playwrights from the Ancient Greek era whose works made it to modern times, and in 1934 George Macy gave his most famous play some exquisite treatment. 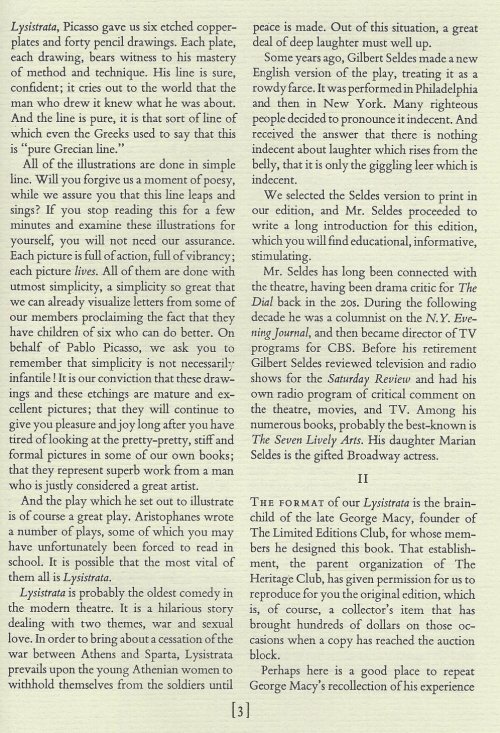 However, before digging into this book, let’s briefly cover the other plays the LEC issued featuring the works of the comedic genius. In 1937, while the iron was still warm from this book, The Frogs was issued featuring the artistic designs of John Austen. This is perhaps the most distinct work Austen performed out of his many commissions, but we’ll have to wait to see that one. In 1959 The Birds came to the membership, featuring Mariam Perry’s decorations. All right, back to this edition. Designed by Macy himself, these boards are textured with a granite-like look with some of Pablo Picasso’s soldier sketches, which make for a striking book. 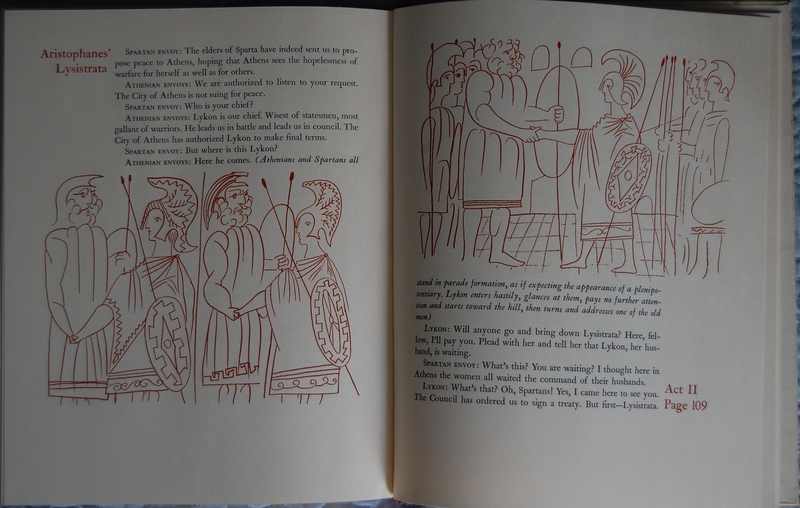 Yes, you did read that right — for one book, the Limited Editions Club got the now-legendary Picasso to provide its illustrations, and I think he did a great job with the comedic Lysistrata. The LEC version goes for big bucks, since Picasso signed it; 150 of those 1500 books also got a complete set of signed sketches, which gives this book even more monetary worth. I don’t have the signed ones, but I’ve included two of those particular items that the book reprints below. Macy chose the type, Caslon, in 18 point size, and specified black for the the text with the drawing reproduced in sanguine. 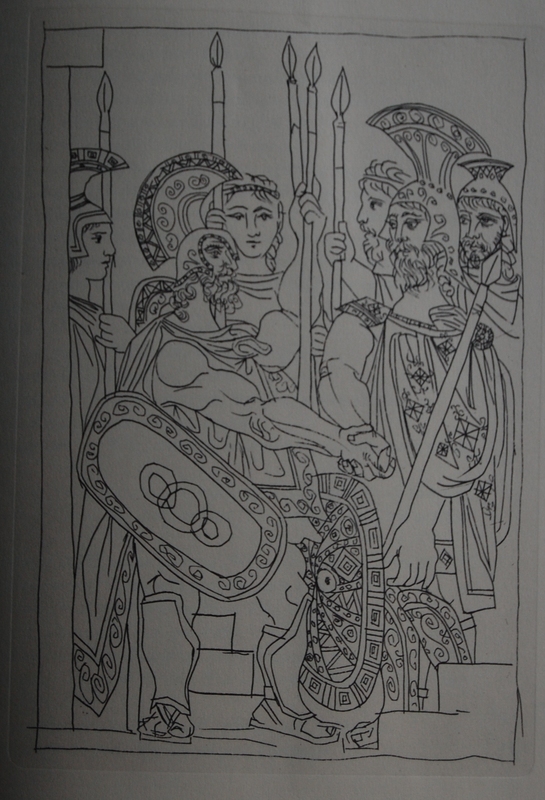 The six etchings which Picasso did for the edition were printed by hand, by Charles Furth of New York–who also printed the Ruth Reeves etchings in the LEC Daphnis and Chloe. The binding was of heavy boards covered with a three color patterned paper with a design made by LeRoy Appleton from the Picasso drawings, and the book itself housed in a double, or chemise slipcase. 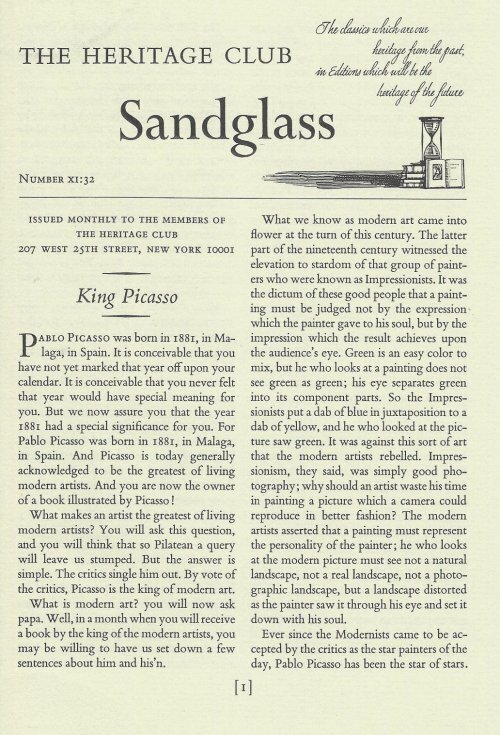 Whereas the Sandglass* spends a fair amount of time talking about Picasso’s achievements during his life–the “Guernica” which has just been returned to Spain by MOMA, following Picasso’s wishes with the end of the Franco regime, and Picasso’s famous UN Peace dove–the Monthly Letter spends half of its four pages selling the subscriber on how he should not be outraged by Modern Art in general, Picasso’s work in particular, and that the Lysistrata illustrations are not only great illustrations, but “will continue to bring you pleasure and joy long after you have tired of looking at the pretty-pretty, stiff and formal pictures in many of our own books.” (I wonder if he wasn’t thinking of John Austen’s illustrations when he made this criticism–a frequent and very popular LEC illustrator whose illustrations are perfectly described as “pretty-pretty, stiff and formal”?) Macy was quite aware that Picasso, though even then recognized as probably the pre-eminent living artist, was also widely hated by many conservative Americans, including a large percentage of LEC subscribers. He was right–in the section of the Monthly Letter called “Files on Parade,” where he prints comments received from Club members, he prints several diatribes by members who were outraged by Lysistrata–which most critics agree now is one of the half-dozen greatest achievements of the LEC. I’d love to see the LEC Lysistrata one day. Thanks to both of you for your insights! Spine – Trumpeting Picasso’s involvement was a wise choice! The slipcase is black. Title Page – The LEC commissioned Gilbert Seldes to compose a new translation for them, which the Heritage Press reprints. Seldes also provides the introduction. 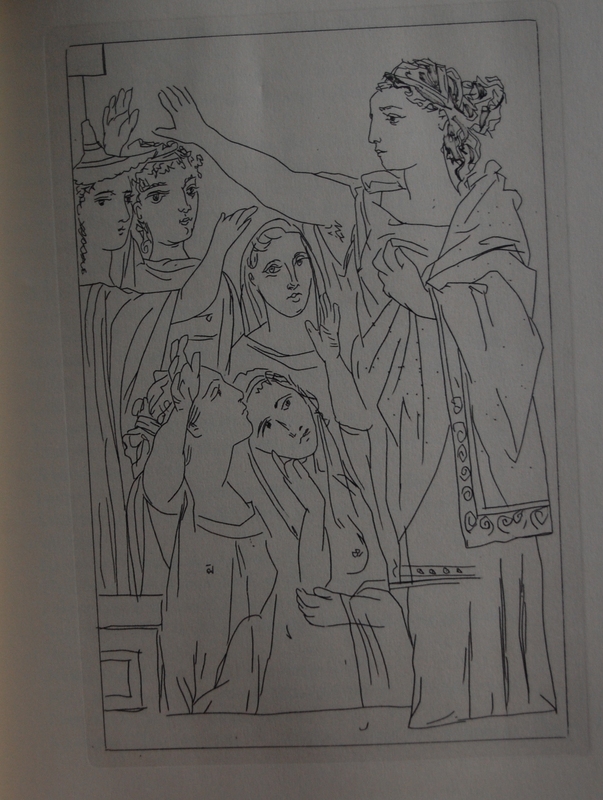 Page 43 – The first of Picasso’s separated sketches is when the women of Greece unite to discuss the war and how to resolve it. Page 111 – After the women devise their plan to deprive their men of sexual pleasure, the war quickly grinds to a halt and peace is made, as this sketch shows. 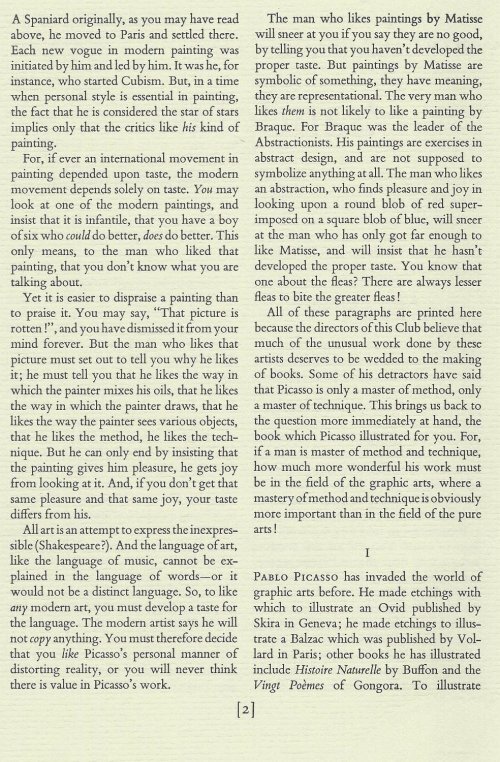 The next image is the text prior to this sketch, which shows more of Picasso’s art done in a simpler style. 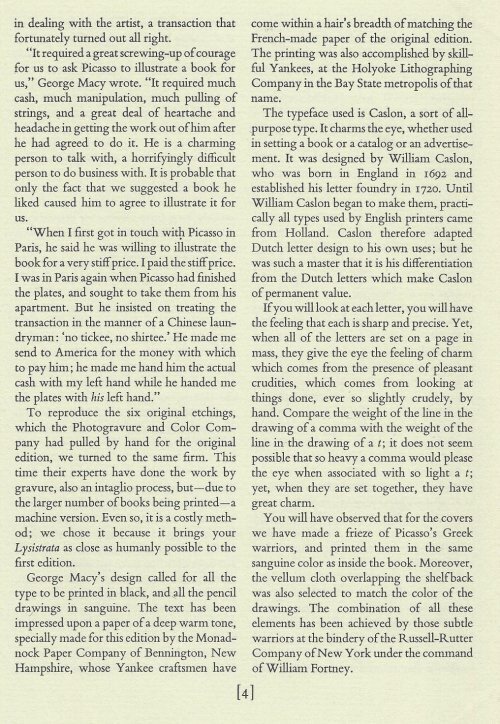 *= Django had a Sandglass for the Norwalk printing, which is not as reliable as ones printed in the Macy Company hands. Its number is also different. I’ll be changing the info on this post in the near future, as I now have a New York Sandglass. I am not equipped or able to help you sell the book, as I have no online store to do that for you with. I also have my own copy, so if you were asking me if I was interested in it, I am not, but thanks for the offer. I would suggest looking into local used book shops or going to Ebay if you want to sell the book. Hope that helps! My blog is not intended to be a place to make such transactions. Please contact her yourself. Her name links to her website, which has contact information. Thanks! 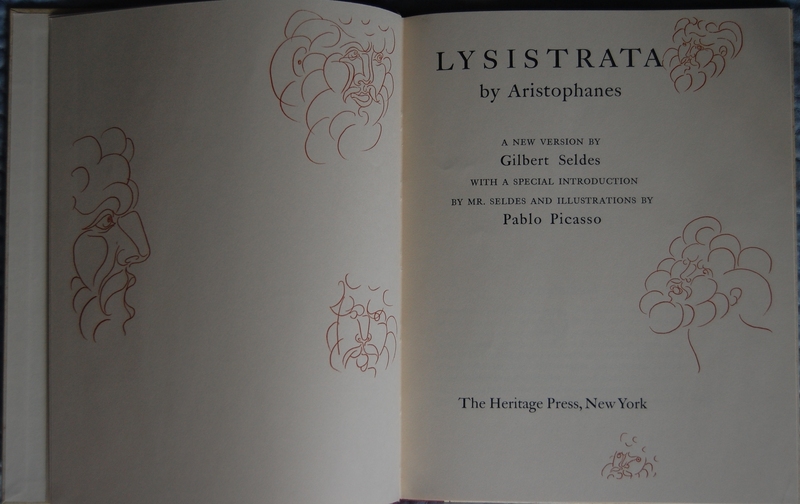 You are currently reading Heritage Press: Lysistrata by Aristophanes (1962) at The George Macy Imagery.